Bright and light are two words that describe the Dell M110 (available for $499 direct) palmtop projector. Weighing in at about 360 grams (minus power block) and with a dimension of 104mm x 105.3mm x 36.5mm, the unit can actually easy sit in the palm of one’s hand. Rated at 300 lumens, the M110 also offers reasonably good image quality. 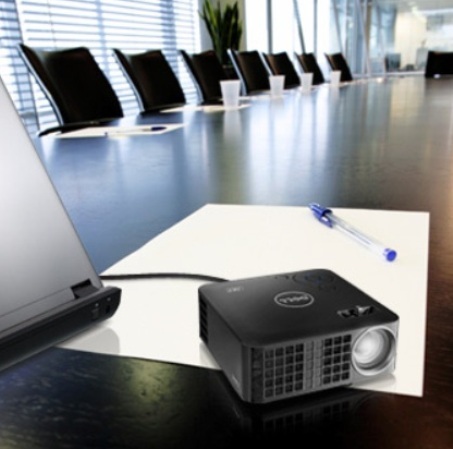 The Dell M110 is ideal for professionals on the go, who need a small, handy projector that’s light enough to carry on a plane or on road trips and easy to set up for a quick presentation. Related Story | Is that a Pico Projector in your pocket? Its cube design doesn’t make it ideal for stuffing into a coat pocket. However, the M110 does come in a handy nylon carryon case that contains the power bar, accessory cables and mini tripod. It’s a breeze to whip out this projector and set it up on a meeting table or desk. The M110 may be diminutive in size but one of its big advantages is the number of physical connections that it affords users. The unit can be hooked up to PCs, Macs, Blu-ray players, games consoles and mobile phones. Users will most likely use the VGA and HDMI ports often, but like other projectors in the market the M110 can also display content directly from memory sticks or cards. The M110 can link to computers wirelessly. The projector has USB 2.0 and micro SD card slots, so in many cases users may not even have to lug around their laptops. There’s also 1GB of internal memory available on the unit itself. The package also comes with a credit card-sized remote control. The machine supports JPG and BMP image files as well as MOV, MP4, AVI, and WMV video files and MP1, MP2, MP3, and WMA audio files. Nestor Arellano is a Senior Writer at ITBusiness.ca. Overall, the design and layout of the M110 is well thought out. The control keys are right on top of the unit and easy to reach and operate. The focus ring and keystone settings have accessible tabs. The unit has a button for settings which allows the quick adjustment of brightness, colour and aspect ratio. Pros – Extremely portable, offers lots of connectivity options, has wireless set up, good picture quality. Cons – Unit becomes noisy and hot, works best in low lighting, no battery. The M110 comes with a 300 lumens LED lamp with a 1280×800 native resolution that projects picture sizes of up to 80 inches (about 200 cms). It also offers full support for 720p HD resolution. Dell claims 20,000 hours of lamp life. Image quality is not exceptional, but the unit projected vibrant images and had pretty good colour reproductions. Video images were slightly better quality overall than data images. Although the image is not comparable to those of larger projectors with 2000 – 3000 lumens, both pictures and text did not appear washed out. The M110 performed best in dimly lit rooms with the blinds pulled down. Despite its size and weight, the projector was stable. Perhaps, because the M110 is so portable, one might expect it to be battery operated as well. Alas, users need to find a wall socket for the device when they set it up. The unit’s fan also tends to generate some noise the moment the M110 is turned on. This could be irritating to people sitting next to the machine. In just a few minutes, the projector also becomes quite hot to the touch. Something that users would need keep in mind in case they get the urge to grab the unit and go after a presentation. This tiny but capable projector from Dell is reasonably priced. For users looking for portability, easy of use and decent image quality normally used for many business presentations, the M110 is an ideal choice.